For at least seven decades, the Minnesota State Fair has run hundreds of thousands of competitions using the basic tools of paper and pens to judge perhaps a million animals including horses, cattle, poultry, rabbits, goats, etc. This year the tools used will be completely different. 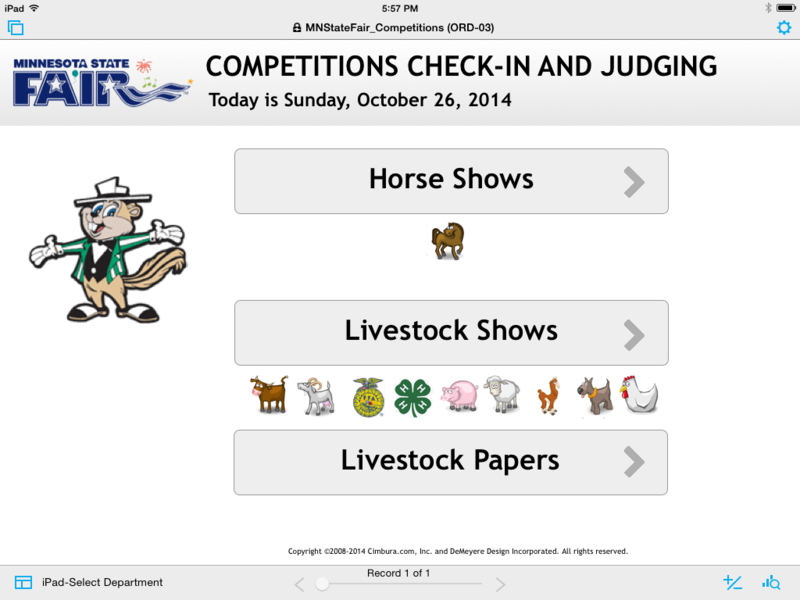 The MN State Fair purchased 16 Apple iPads that will be used to quickly check-in each animal as they arrive to the judging areas and then enter and tally immediate judging results. 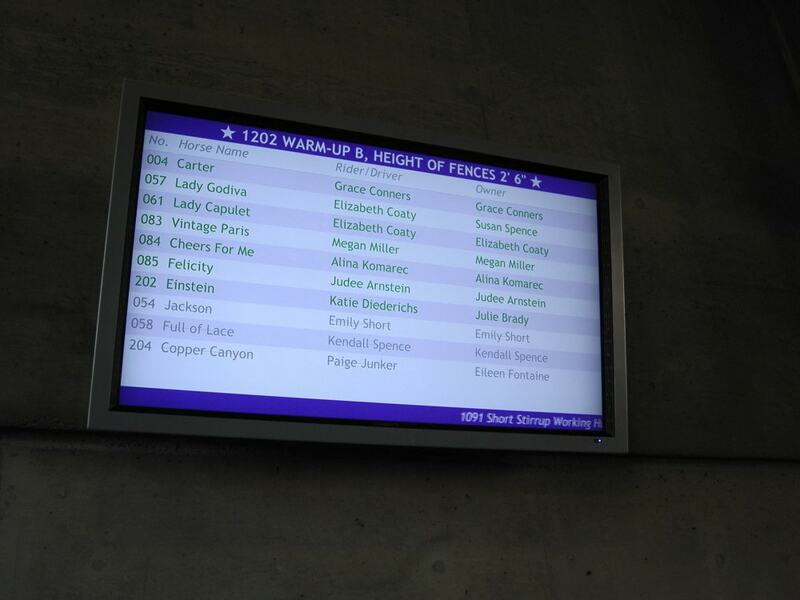 Competitions results will be available within seconds for fair goers to view on a huge 15 foot screen in the Warner Coliseum. Four other weather-proof 55″ LCD screens in the cattle barns and coliseum will provide up-to-date information to exhibitors so they will know when to get ready and what competition comes next. In the past, all the paperwork was tallied at the end of the day and the results might not be available until the following day. The solution that powers this system was custom developed by FileMaker Business Alliance Platinum member LuminFire. 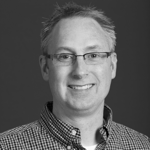 It fully demonstrates the power of FileMaker database technology. The solution was shown at the FileMaker developer conference in San Diego, CA as one of the most notable FileMaker Go iPad applications developed this year. Check-in of the animals as they enter the ring. Selection of all the winners and assigning prize ribbons. Automatically moving winners to championship competitions. Snap shot photos of the winners. Verification of the results through signature capture of the judges. Immediate tallies of premier points…a process that was very prone to error and took significant time to do by hand. Connects to a web online database registration information source via ESS (External Sequel Source) to bring in the latest online registration entries and exhibitors for all competitions. Tracks all entries, prizes, and exhibitors in the appropriate competitions. 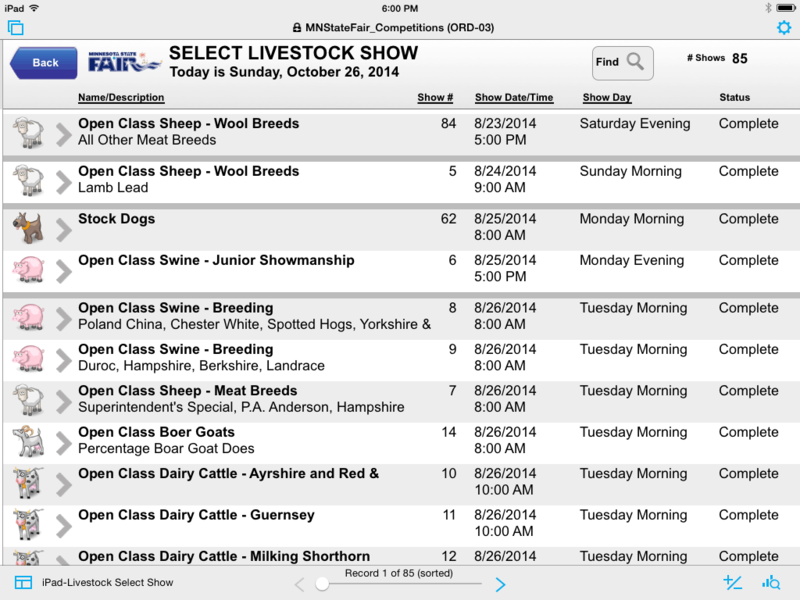 Generates hundreds of reports required before and after the fair. Manages hundreds of competition specific exceptions. Prints prize checks for premiums and payments. Drives data to 5 large screen displays through full screen web viewers installed on Mac Minis utilizing PHP to connect directly to the data sources. 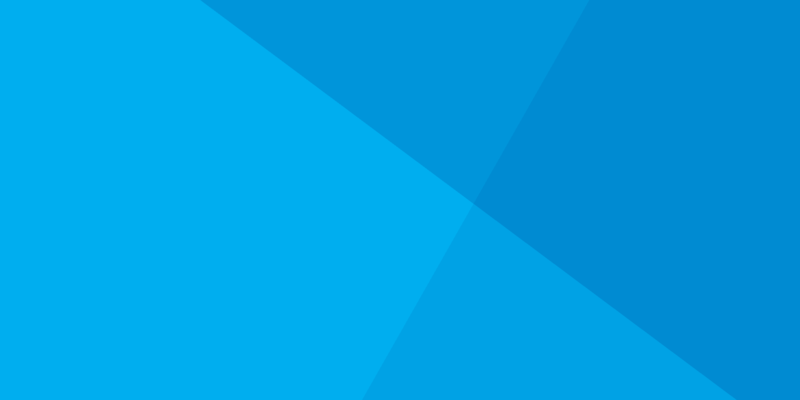 “We use FileMaker for its incredible flexibility, ability to work across operating systems (Mac, Windows, and iOS), speed of development, and cost effectiveness. FileMaker has put the vast sea of exhibitor and entry information into a format where we can get any kind of report at a click of a button…and so we can easily react to changes. This year we’re expanding the solution to include real-time results which will reduce labor costs significantly into the future. We are positioned to take advantage of technology improvements and be proactive in making any changes necessitated by external regulations. Come out to the Minnesota State Fair and see the future in action today! There are approximately 11,000 livestock entries including beef, dairy, swine, sheep, goats, llamas, stock dogs, and poultry in almost 5000 competitions. 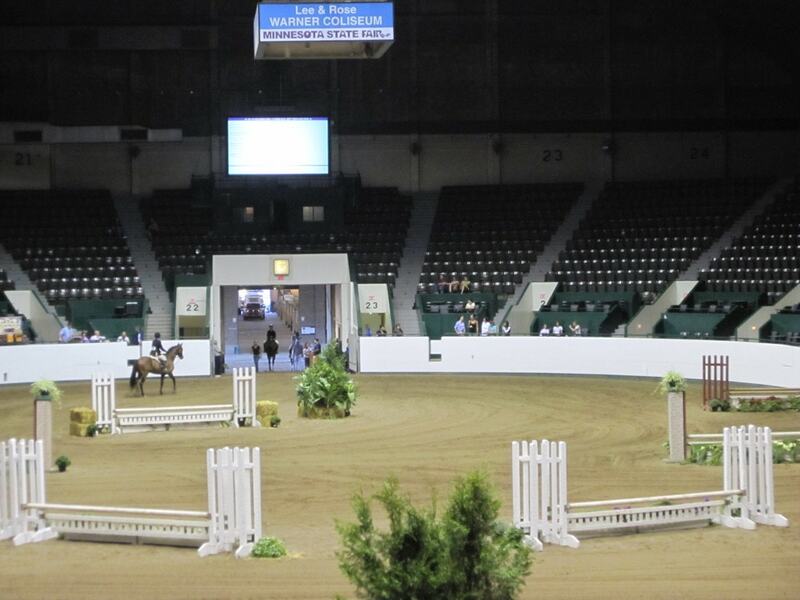 Horses entered include about 2500 in english, miniature, draft, western, and saddleclub categories combined competing in almost 700 individual competitions. In 2010, approximately $1 million in prizes were awarded to exhibitors. In 1859 the premium paid for “best horse” was $4…or one third of the entrance fee for 1 person to the fair today. The Minnesota State Fair is the largest state fair in the U.S. in terms of average daily attendance. 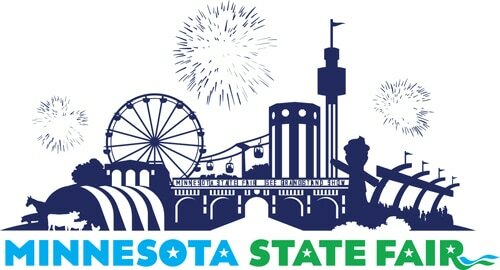 Check out the new MN State Fair iPhone app that includes fun, food, and merch finders as well as an interactive GPS map so you can find the competitions. Apple’s iPad tablet computer is showing up in the darnedest places – including the Lee & Rose Warner Coliseum and its fauna-friendly surroundings at the Minnesota State Fair. That’s where all manner of creatures – horses and cattle, goats and swine, dogs and llamas – strut their stuff and get judged as part of the Fair’s animal competitions. For the judging staff, who are part of the Fair’s competition department, this used to be a pain in the neck (and the wrists). They wrote down their results on sheets of paper and later entered the information into computers back at the Fair offices. Hello, iPad! Now the staffers pull up lists of competitors on their tablets and then simply tap, tap, tap to rank them as the competitions progress. Some use fingers for this, and others get fancier with special soft-tipped styluses that cut down on the screen smudging. This also means fairgoers get competition results sooner. They pop up on big displays inside and outside the coliseum for all to see. 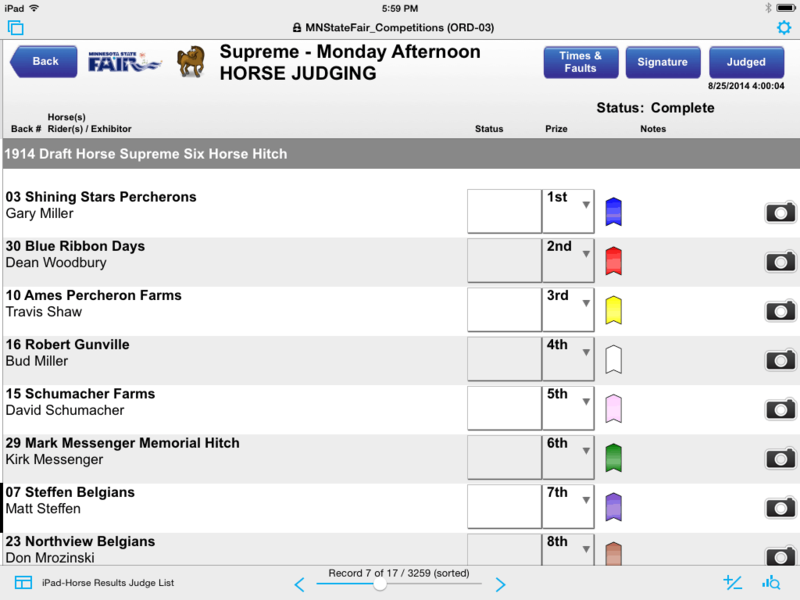 Competition clerks are not the only ones on iPads. 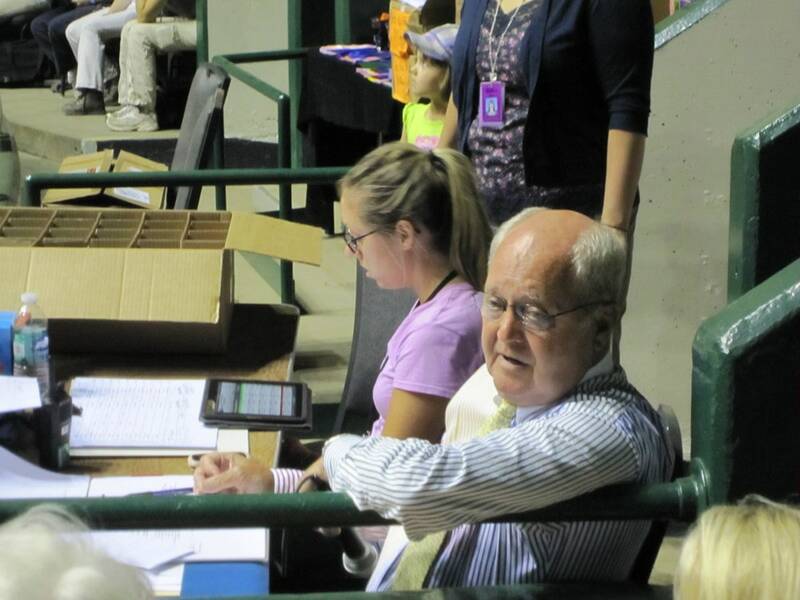 Other competition-department staffers serve as the gatekeepers, checking in the four-legged contestants as they arrive – or marking them as “scratch” if the critter owners withdraw from contention, or “no show” if, well, they don’t show up. This is easy on an iPad: Pull down a menu, select the right category and repeat, repeat, repeat. This information is also shown on screens so animal owners have a better idea when they have to queue up, thereby cutting down on the furry equivalent of freeway congestion. Heck, all this iPad-instigated efficiency even means competition winners snag their prize money sooner. 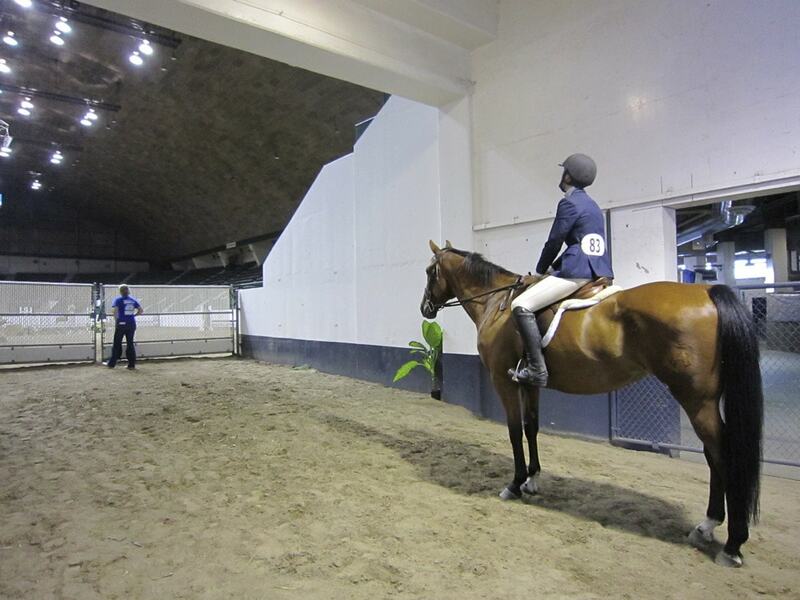 Here are some photos of the coliseum during horse show showing the large screen displays, judges using the iPads, some iPad screen shots, and for those of you that are technically inclined, a diagram of the underpinnings that make up this complex system.